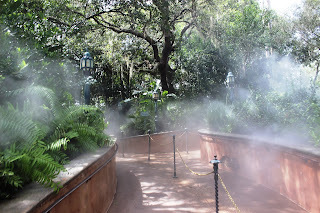 If I’ve learned one thing in my time visiting the Port Orleans – French Quarter resort, it is that it doesn’t have to be February or March for it to Mardi Gras! The spirit of living life to its fullest is a party that lives on each and every day at this resort on the banks of the Sassagoula River. From the colorfully manors adorned with wrought iron, to the frog fountain, and cobbled avenues with clever names, there is a lot to love. 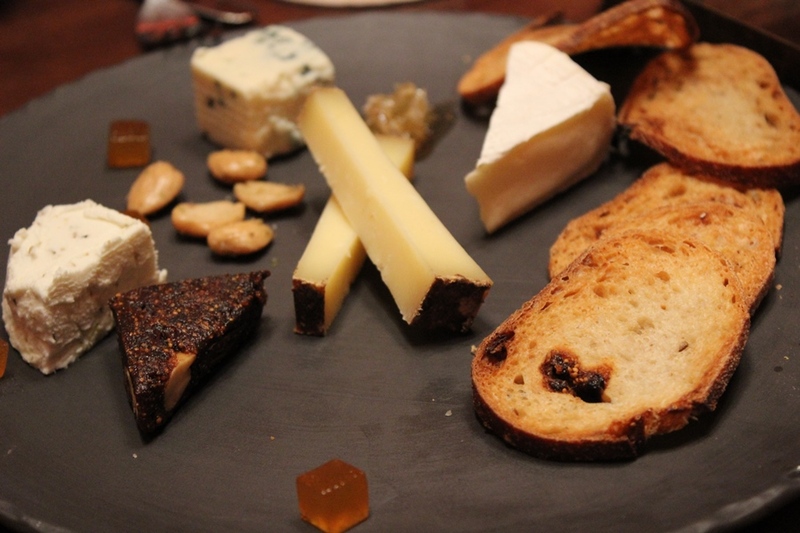 Even the food has a wonderful joie de vie to it, especially the beignets. 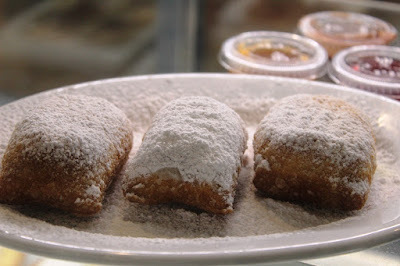 Found at Sassagoula Floatworks and Food Factory, the beignets are made fresh to order. An order, coincidentally, is either three or six beignets, and each beignet is half the size of my head. So, order wisely and remember that you can always come back for more. Each beignet is a pillow of fried dough goodness that is perfectly chewy. The rest of the flavors from the dough may get lost in the mountain of powdered sugar that gets heaped upon the beignets. With these pastries being hot, the powdered sugar makes a nice glaze on them, but there is still an ample amount of powdered sugar for you to devour. Yes, you’re going to get a sugar rush, but it is the best sugar rush you could ask for. Oh, a word of caution, due to the copious amounts of loose powdered sugar on the beignets, be careful not to inhale the sugary dust. You will start a coughing fit that is sure to dampen the pure joy these are meant to bring to you. In addition to the beignets themselves, you can opt to add a selection of three sauces to the side for dipping. The sauces include caramel, raspberry, and chicory coffee ganache. For me, the fruitiness of the raspberry won me over, but for my wife it was the chicory coffee ganache. I’m not a coffee fan, so that deterred me from the get go, but even I will admit that this sauce sounded and looked amazing. The caramel is fine, but when there’s already so much sugar in the dessert, it sort of loses is punch. But if you’re a caramel fan, this is a great addition. The beignets at the Sassagoula Floatworks and Food Factory may have more sugar per bite than any other dessert in Walt Disney World, but they are worth every single bite. If you don’t like sweet desserts, I hope I’ve discouraged you from trying these, as the beignets will definitely not be your thing. However, if your motto is the sweeter the better, than you definitely need to make your way down to Port Orleans – French Quarter. 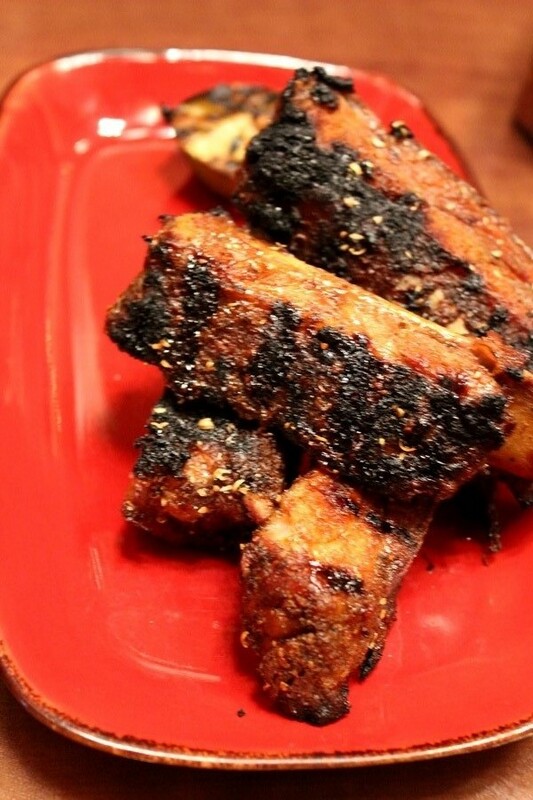 This’ll be a Mardi Gras for your taste buds! The tradition of dioramas representing Disney animated features brightening up the windows of the Emporium on Main Street, U.S.A. dates back to Disneyland in the 1960s. 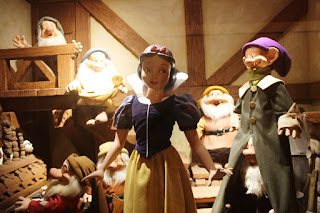 In the Magic Kingdom, they have been present since the park opened in 1971. 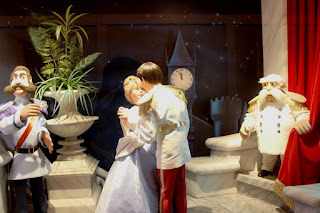 The Enchanted Windows feature a single scene from a particular film, with some minor movement of the characters, and a plaque detailing the movie’s title, date of release, and a brief synopsis. It goes without saying that these windows have delighted guests young and old to no end though the years. 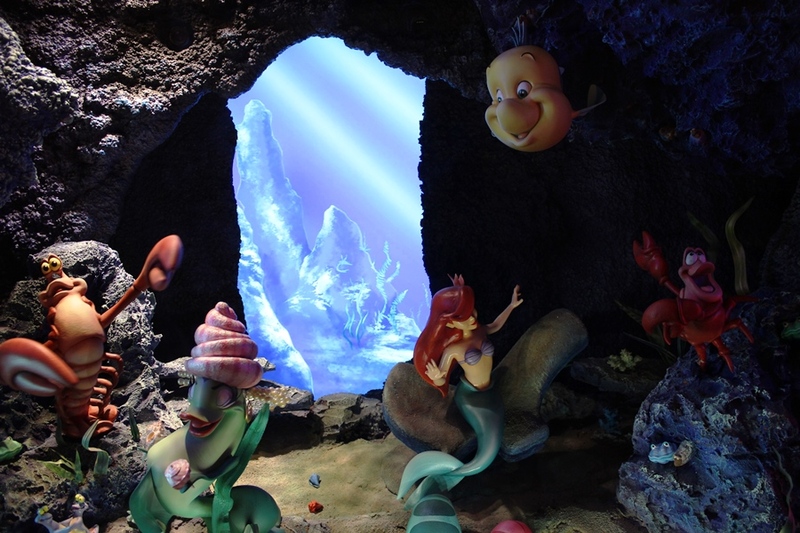 Various films have been featured over the years, and many changes have come to the windows, such as the window dedicated to The Little Mermaid also being a portal for the Sorcerers of the Magic Kingdom interactive game. Also, during the holidays, the windows are changed over to recount the entire tale of Mickey’s Christmas Carol through six scenes. While the films may change, the joy they bring is evergreen. 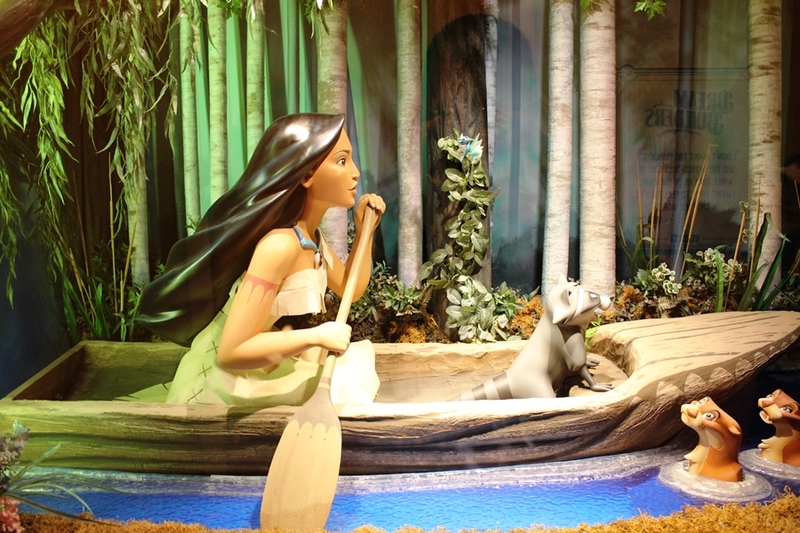 Let’s take a quick stroll around the Emporium’s windows today and catch a glimpse of which tales are being highlighted. 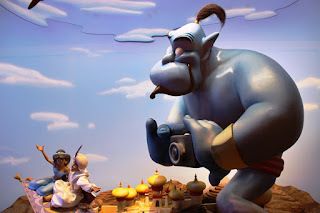 On Sunday, April 26, 1998 viewers of The Wonderful World of Disney were treated to a special look at the world’s newest theme park, Disney’s Animal Kingdom. 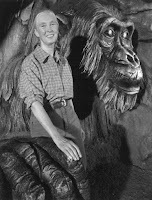 The episode was titled Disney’s Animal Kingdom: The First Adventure. Also, in case you were wondering, the ABC Sunday Night Movie that would follow this special was Apollo 13. Promotional materials for the show featured various photos of then Disney Chairman and CEO, Michael Eisner, and Dr. Jane Goodall in various areas of the park individually and together, but the show featured so much more than that. 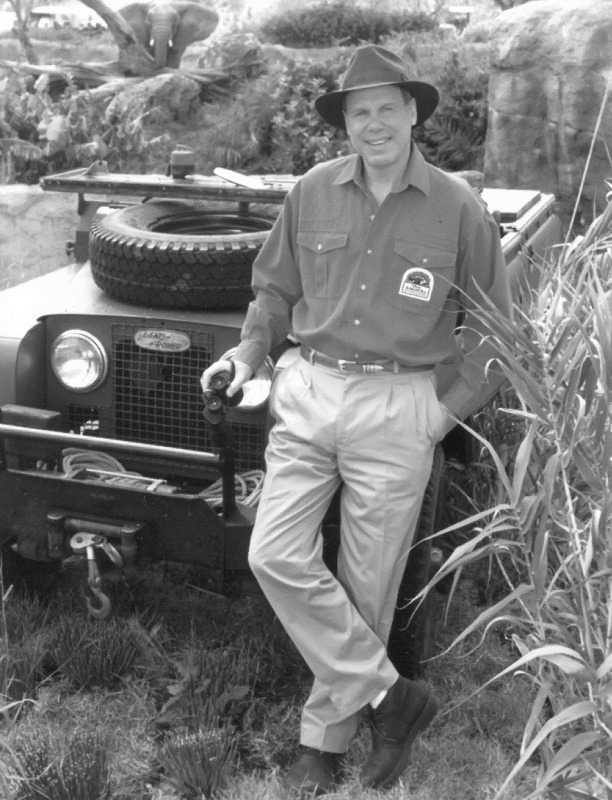 The special starts, as all episodes of The Wonderful World of Disney did at the time, with Michael Eisner. 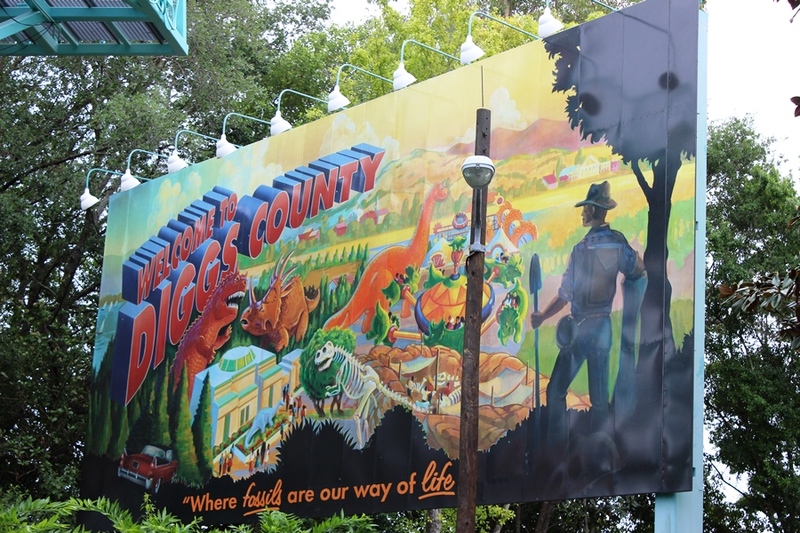 He briefly speaks about Walt Disney himself, his care for animals, how that brought the company to where it was in 1998, and how the park was born from our fascination, love, and respect of animals. It then moved on to Lebo M. standing atop the roots of the Tree of Life singing a wonderful rendition of Circle of Life with Ladysmith Black Mambazo. 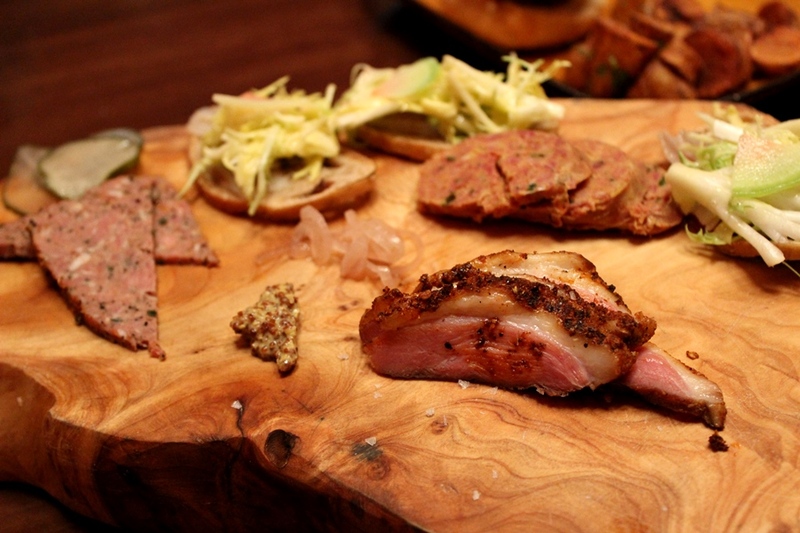 This rendition is one of two highlights from the special that you should definitely seek out. The other we'll get to at the end of this article. From there, we descend into complete Disney/ABC shtick with the The First Adventure's host, Drew Carey. He is joined by a host of ABC personalities taking in the park. First up is Jane Seymour, James Ketch, and their family, who venture out on a safari you or I would swoon over. 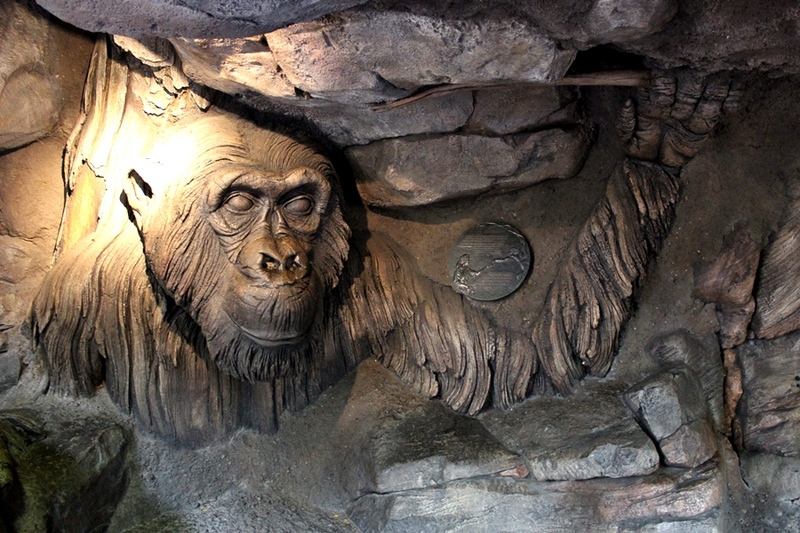 Their trek begins by arriving in Harambe aboard the Wildlife Express, meeting the mayor of Harambe, and then having a personal ride aboard Kilimanjaro Safaris with one of the park’s senior animal care cast member. 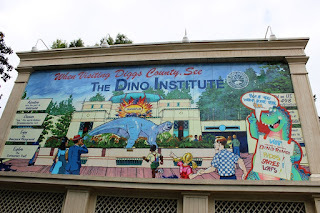 Next up Tia, Tamera, Tahj, and Tavior Mowry make their way through DinoLand U.S.A., escorted to Countdown to Extinction by some off the wall residents of The Dino Institute. Danielle Fishel and Will Friedel welcome a newborn gorilla on Pangani Forest Exploration Trail, take in the sights of Conservation Station, and learn about Flights of Wonder. Elsewhere, Paul Rodriguez visits It’s Tough to be a Bug, entertainers perform at the entrance to Harambe, and there are segments featuring random Animal Kingdom fun facts. Kimberly Scott also makes a pair of appearances, singing We Are One (no, not that one, the one from The Lion King 2) and Circle of Life. While there is a lot of silliness and exaggerated moments during the special, there are also some great things early views and experiences to take note for. For starters, there are clips of both the Discovery River Boats and the Audio-Animatronics figure of Aladar that once sat along the banks of the Discovery River. The more impressive thing is realizing that the park is full of vegetation that has grown into to what it is today. This means that plants are smaller, there are spaces between them, and many of the views are unobstructed. 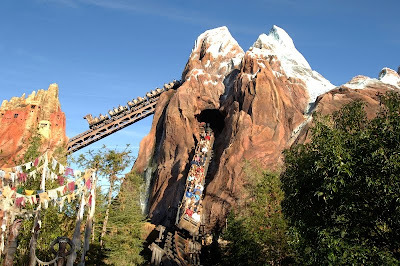 Tomorrow is the twelfth anniversary of the opening of Expedition Everest. Disney's Animal Kingdom may have been a rebirth of storytelling through environment for the Imagineers, but Expedition Everest raised that bar to a whole new level. 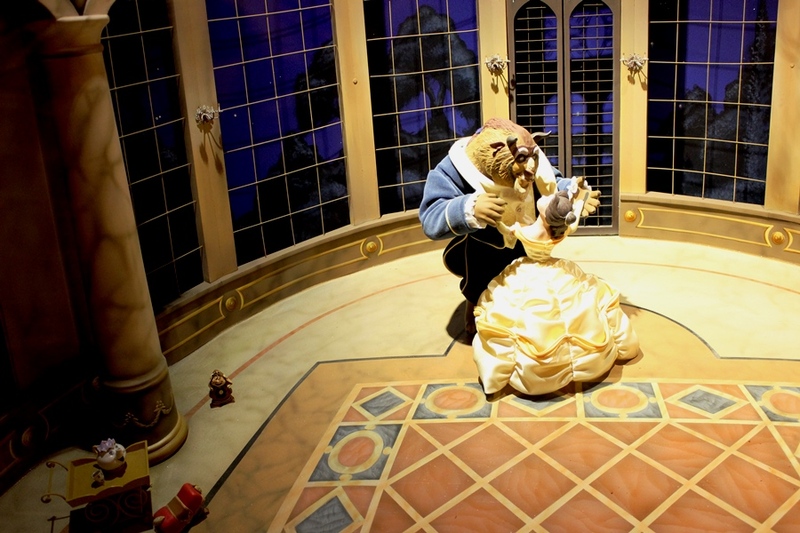 The attraction isn't without its problems, but there is a lot to love and explore when it comes to the details and stories presented throughout Serka Zong. It is one of my favorite areas to explore, and I'm always finding a new story to excavate and share. Today, let's look back on one of our first exploration of the attraction's press photos, from research to reality. 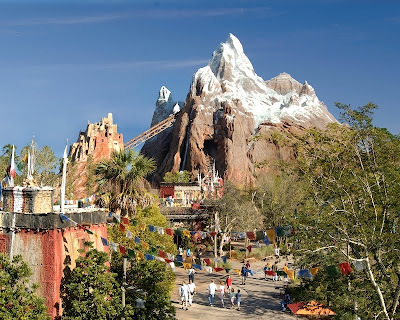 It should come as no surprise that Expedition Everest, through its queue, surrounding area, and attraction itself, has completely captured my imagination. Even more so, the story of its creation and the research that went into the area’s design enthrall me. Stories such as these are the reasons I love Disney and hope that one day I will be able to help create my own magic. 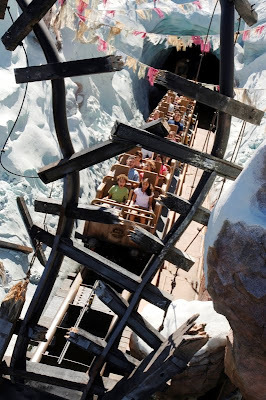 Personal thoughts aside, however, I thought that many of us out there would like to journey back to the early days of Expedition Everest and see some of the first photographs released from Disney in 2006. 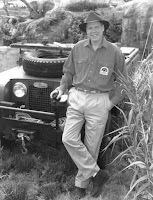 These photographs range from the attraction itself, to Serka Zong, and even beyond to the true life adventure Joe Rohde and his team ventured on in search of their Everest and yeti. Personally, the photograph of Everest at night, using a white light rather than the current color scheme, is one of the best night shots I have seen of this mountain. 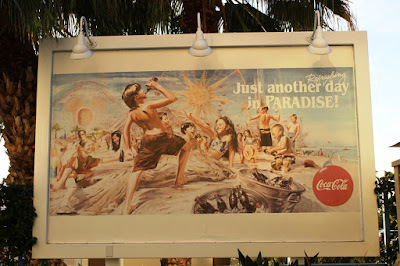 Music plays an important role in the world of Disney theme parks and resort. It carries us through the various lands to our attraction destinations and the songs embedded in those same attractions are the same songs we find ourselves singing back home. Often times, decades after the songs themselves have been retired. One area that can get overlooked is the music in the queues of some of our favorite attractions. We can get so caught up in that fact that we can’t wait to board the ride vehicle, that we miss the musical cues around us. With that in mind, we’re here today to highlight our six favorite queue soundtracks. 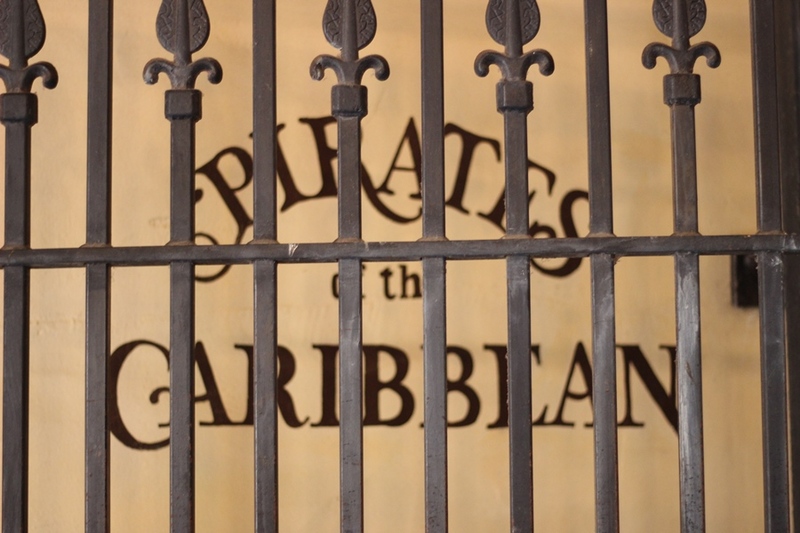 Pirates of the Caribbean – This is one of the finest examples of using a cinematic overture to prepare guests for what’s in store for them. 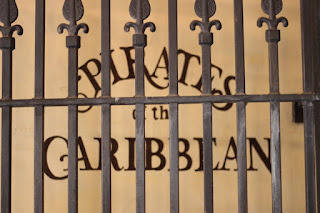 For those guests who have experienced Pirates of the Caribbean once or twice (or a hundred times), the familiarity of Yo Ho (A Pirate’s Life for Me), even presented in a different arrangement, is unmistakable. To the untrained ear there are mysteries or even a swashbuckling element to the music at times, setting guests up for the perfect high seas adventure. Big Thunder Mountain Railroad – Call it nostalgia or whatever you like, but listening to the bows work their magic across the fiddle or violin with a foot stomping beat has always been one of my personal favorites when it comes to queue music. In Big Thunder Mountain Railroad, the train, visibly racing by just outside the window, and its whistle are as much a part of the soundtrack as anything, but those square dance inducing melodies are simply wonderful. Test Track – Switching gears, quite literally, is the music found in the queue for Test Track, otherwise known as the Chevrolet Design Studio. Much of the queue speaks to the design process and how every vehicle starts with a single line, the music here builds in a very similar manner. 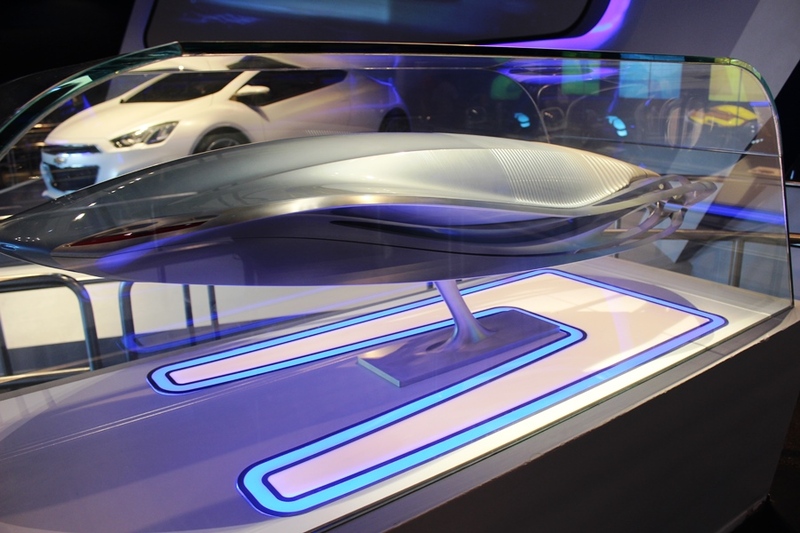 By starting out small and revving up, guests get the feeling of motion and speed, whether they recognize it or not, which is exactly what’s in store for them once they board their sim car. 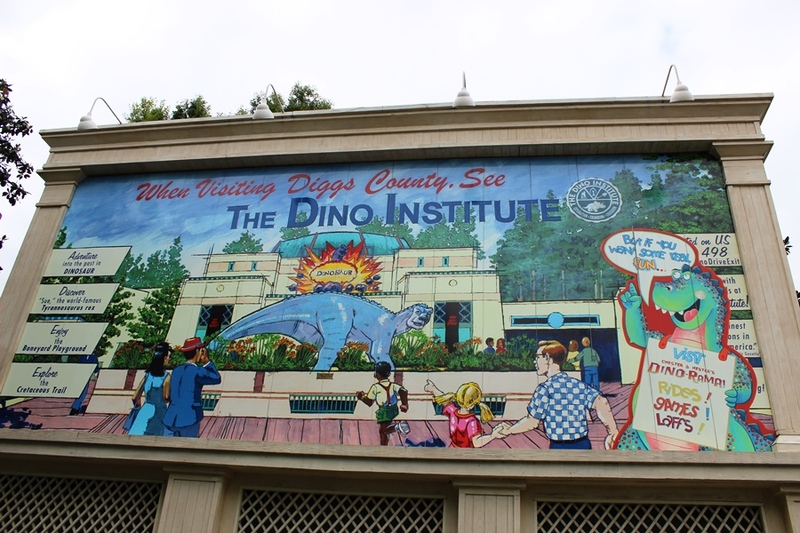 Dinosaur – Dinosaur was originally known as Countdown to Extinction, a fact that becomes abundantly clear when you realize the number of times the letters CTX show up in the queue. 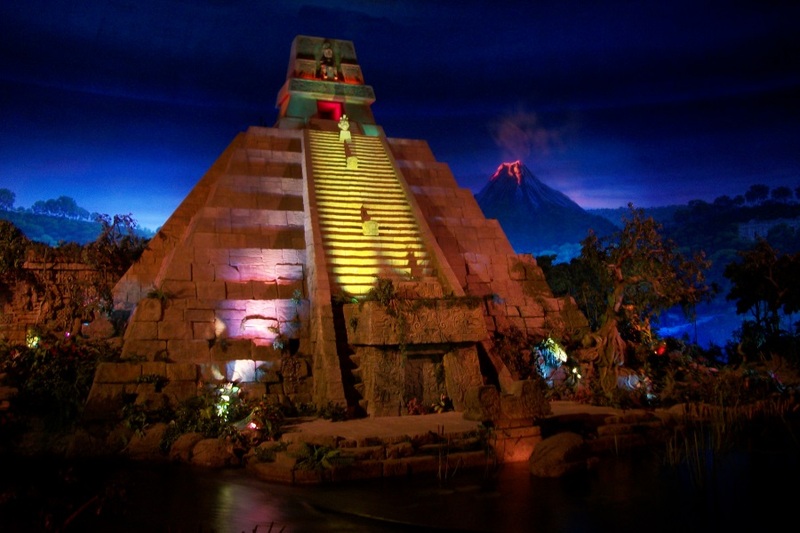 In fact, they’re even in the land-that-time-forgot type music present throughout guests’ waits for the attraction in the CTX Theme. There is very rarely a substantial line for Dinosaur, which makes this music rather difficult to fully appreciate. Yet, as it says above, there is something epic and bold, while subdued in sections, that makes you feel as if you’re about to head off to a place people have very seldom visited. Space Mountain – If you’ve ever spent any amount of time in the Space Mountain queue you know the intergalactic tones that play over and over. At some point, in the dark of those spaceport corridors, you may feel as if you have lost all track of time, but those quietly hopeful notes are always welcoming. 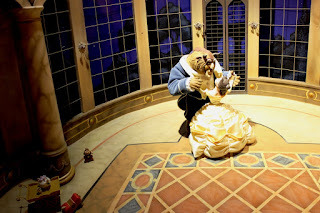 They may not provide adequate preparation for what is coming next, in fact they may lull some guests into feeling warm and safe, but the music is some of the most recognized in the parks. Tower of Terror – There is simply no way that the loop played throughout the grounds of the Hollywood Tower Hotel wasn’t going to make this list. It is one of the quintessential queue loops, and probably the one I play most around my house and office. The emptiness of the hotel lobby and gardens, mixed with jazz from another time (from Mood Indigo and Deep Purple to We’ll Meet Again and Another World) firmly sets this queue’s roots in the boundary between spooky and the golden age of Hollywood. Computers were once the size of a house. If you don’t believe me, you can simply follow along with Spaceship Earth’s narrative as presented by Dame Judi Dench. 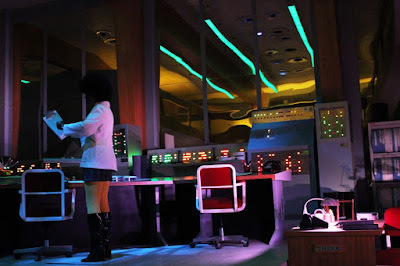 In one scene we can see large computer banks that occupy a mirrored space being overseen by a pair of engineers, maybe scientists (their professions are not as interesting as their personal style). There is also a desk near the female figure that features a sign that simply states “THINK.” You can see it on the side of the desk in the lower right corner of the photograph above. Motivational messaging has long been a part of the corporate office space, but this sign has a larger story to tell. 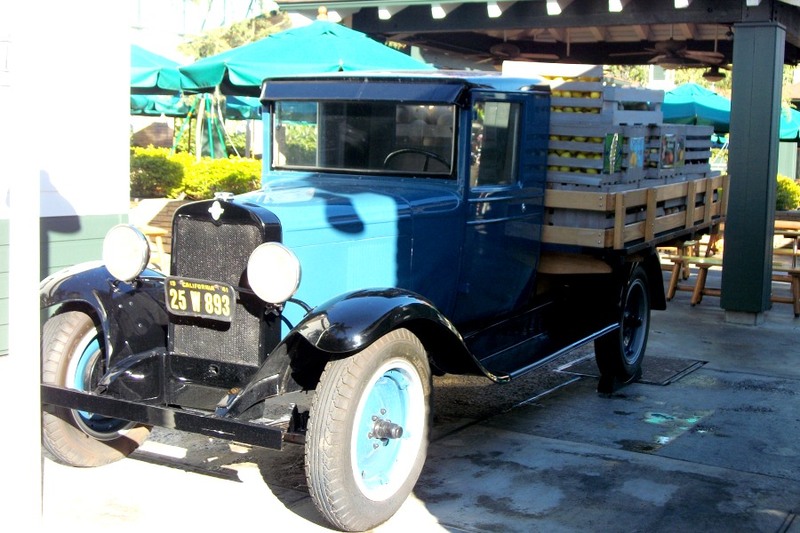 The slogan is attributed to Thomas J. Watson and a sales and advertising meeting that took place in December of 1911 for the National Cash Register Company. As the story goes, the meeting was a typical filling time, but not achieving anything type of meeting until Watson interrupted and stated, “The trouble with every one of us is that we don’t think enough. We don’t get paid for working with our feet – we get paid for working with our heads.” He followed this statement up by promptly writing the word THINK on the chalkboard in the room. That’s all well and good, but how do we get the slogan into a room filled with computers? The jump isn’t all that hard. In 1914, Watson would move on to the Computing-Tabulating-Recording Company, where he would take his THINK mojo with him. That company would later become IBM. The THINK motto would become so ingrained in the IBM culture that by the 1920s it would overtake all other slogans within the company. It appeared in offices, plants, calendars, and, by 1935, the employee publication known as TIME would be renamed THINK. It wouldn’t take long for the outside world to notice the attitude and simplicity of the THINK motto and for that need to inspire to spread. IMB would begin creating signs in wood, stone, and even bronze that were emblazoned with the one word maxim. These signs would then be distributed to customers. In 1948, the total number of signs IBM would present to customers was right around 9,000, but by the year 1960, however, that number had skyrocketed to 20,000. This is likely how we ended up with a copy adorning our computer room desk in Spaceship Earth. 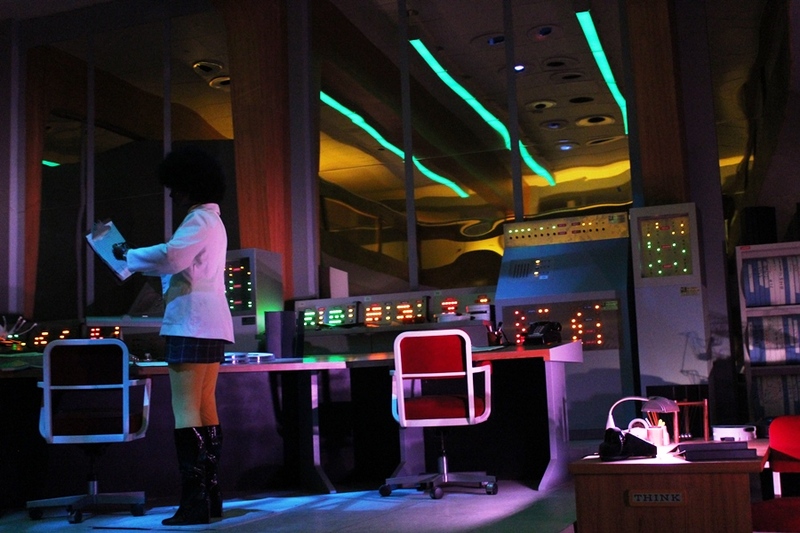 Spaceship Earth is all about communication and how technological advancements throughout history have made it easier for us to communicate. Going back to our original thought, computers were once the size of a house, but a single, small word can be communication enough to change the world.